We also offer instructional programming for many ages through Youth Sports & Instructional Programs. Please note that all services require registration through Parent and Outreach Services. Thank you for choosing West Point CYS & we look forward to supporting you very soon. Click here for the latest West Point Child and Youth Services Parent Survey. Stony Child Development Center (CDC) is accredited by the National Association for the Education of Young Children (NAEYC). Combined with Army standards and regulations, NAEYC guides the CDC program towards the highest quality of care for your children. CDC classrooms are mixed age groups consisting of 6 weeks to 18 months, 16 months - 36 months, preschool and a separate pre-kindergarten program. The classrooms are arranged in interest areas of literacy, math & science, art, blocks, dramatic play, manipulative toys and games. Our program is designed to positively promote the four areas of development: social/emotional, physical, cognitive and language through exploration, experience and fun. Patrons can request care at the CDC by creating an account on MilitaryChildCare.com or registering at Parent and Outreach Services. 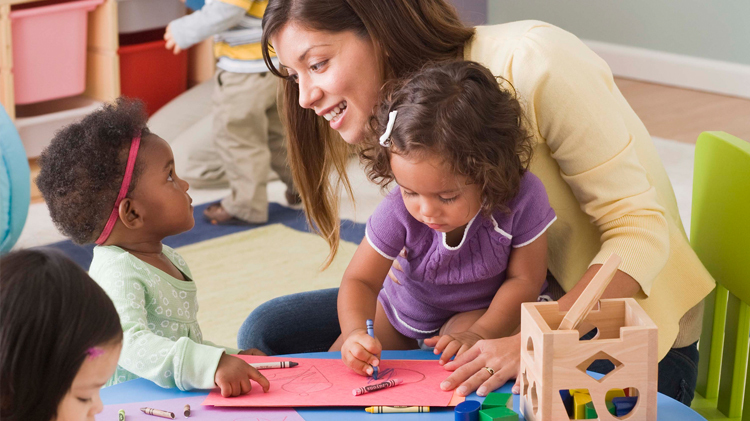 Summer Hours: Monday - Friday 6 a.m. - 5:30 p.m.
Child Development Center (CDC) is accredited by the National Association for the Education of Young Children (NAEYC). Combined with Army standards and regulations, NAEYC guides the CDC program towards the highest quality of care for your children. CDC Hourly classrooms are mixed age groups consisting of 6 weeks to 18 months, 16 months - 36 months, and preschool programs. The classrooms are arranged in interest areas of literacy, math & science, art, blocks, dramatic play, manipulative toys and games. Our program is designed to positively promote the four areas of development: social/emotional, physical, cognitive and language through exploration, experience and fun. 1. Sports, Fitness, and Health Options. 4. Academic Support, Mentoring, and Intervention. Our 5,000 sq. ft. building has four large classrooms and a beautiful playground. Healthy food choices are planned by a nutritionist and served daily. In addition, we offer sports & fitness programs and a variety of clubs. The clubs generate from the interests of the children and change periodically for all to enjoy! SAC Partnerships with 4-H, the Boys and Girls Club of America (BGCA), and the Josephson Institute of Ethics Character Counts! Curriculum provides children with additional options and opportunities for enhanced program options. 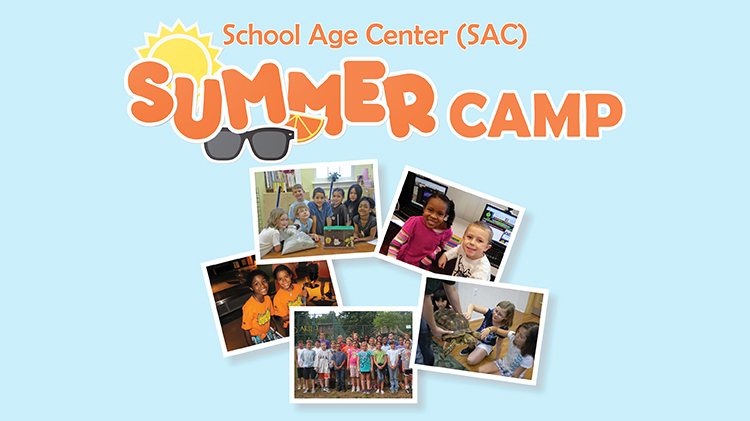 SAC provides before and after school care for (grades K-5), at the School-Age Center, building 140. Patrons interested in using SAC are required to register prior to utilizing services. Please contact the CYS Central Enrollment Office at +1 (845)938-4458 or +1 (845)938-0939 to make a registration appointment. Required forms can be found on the Parent and Outreach Services portion of the CYS website. 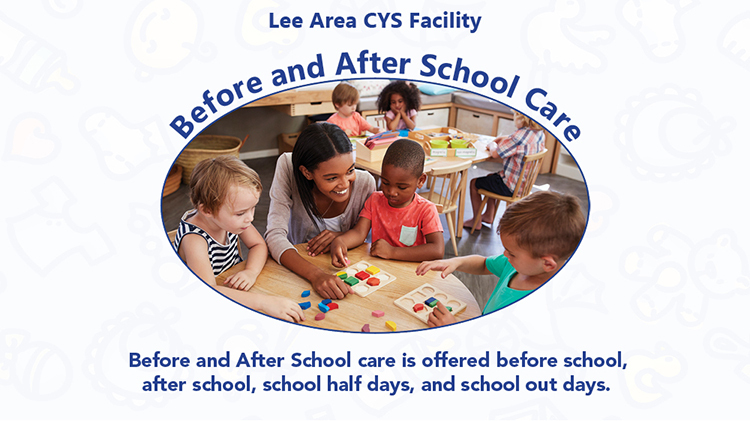 Lee Area CYS Facility will be offering child care on an hourly basis for ages 6 weeks to fifth grade. The hourly program is designed to positively promote the four areas of development (social/emotional, physical, cognitive and language through explora-tion, experience and fun) on an hour to hour basis only. Hourly care will be availa-ble on a first come first serve space available status. Reservations for hourly caremust be made via webtrac. The Part Day Preschool (PDPS) program is designed to promote and support growth in all areas of early childhood development. 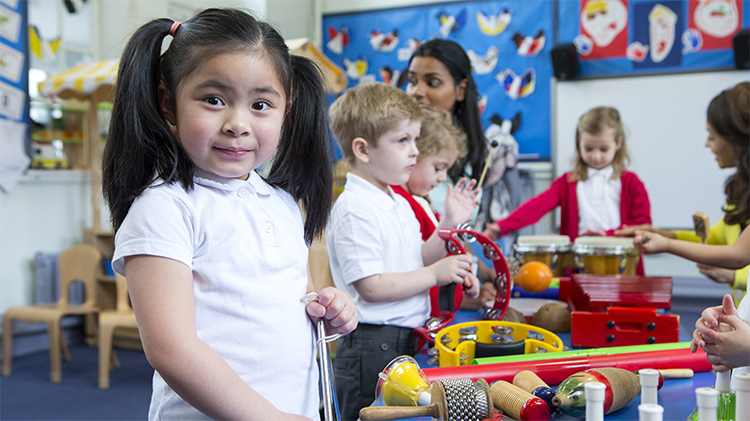 Activities, environments and interactions are tailored to help children develop and refine skills in the areas of Social/Emotional Development, Physical Development, Cognitive Development, and Language Development. 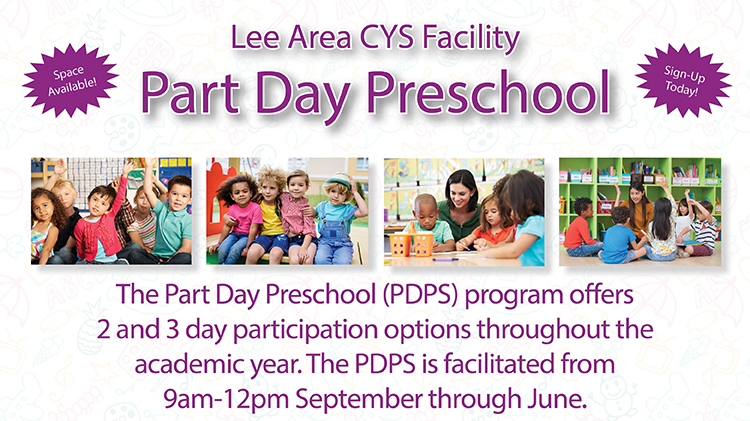 The Part Day Preschool (PDPS) program offers 2 and 3 day participation options throughout the academic year. The PDPS is facilitated from 9-12pm daily beginning in September and ending in early June. Camps are offered for children in K-5th grades. We are currently offering care to civilians during their spring and winter breaks which are scheduled at different times then the West Point Schools. Summer camp applications are accepted in early spring. During summer camp we offer swimming, bowling, off-post field trips (Science Centers, Aquariums, Water Parks, Museums, Zoos, ferry boat cruises, barbeques, arts & crafts, BGCA & 4-H/Clover-bud activities, gardening, cooking, technology, sports & fitness, clubs, and daily learning opportunities. The summer camp program is extended to meet the requirements of our civilian workforce whose children are not part of the West Point school system. Summer Camp Hours are 6a.m.-5:30pm. Power Hour occurs daily and is an educational enhancement program that helps children and youth with homework, finishing assignments and tutoring to gain proficiency in specific areas such as math or language arts. Power Hour is designed to raise the academic proficiency of club members ages 6 to 12. We offer homework assistance throughout the day keeping many textbooks from West Point Elementary & Middle School on hand. This is a framework centered on basic values called the Six Pillars of Character: trustworthiness, respect, responsibility, fairness, caring and citizenship. These traits are reinforced daily. Each week a “Star of the Week,” who exemplifies these pillars is selected and celebrated by the children. Beginning around the start of the 20th century, 4H was established through the efforts of youth-oriented people in several areas of the United States. The “learning by doing” model came from the desire to make the education provided by public schools more available and relevant to youth living in rural parts of the country. In recent years the program has further emphasized its devotion to life skills development in youth, and does so through 4-H’s traditional hands-on learning approach. 4-H helps children to do better in school, learn to help others, and feel more capable and responsible. In settings like clubs, camps, after-school programs, and trips, the 4-H Youth Development program helps youth reach their fullest potential. Members have opportunities to connect to Cornell University, learn through hands-on activities, lead, be inspired, inspire others, and so much more. SAC incorporates 4-H into the curriculum on a weekly basis. 4-H and Clover-buds each meet once a week. All of the youth and staff are registered 4-H members. Some of the many projects that we are working on this year include creating rockets, clocks, string art, gardening, and community service. Both long term and short term activities are included in the syllabus. A qualified fitness instructor provides Sports & Fitness instruction at SAC three times a week. The Sports & Fitness programs focus on fair play, teamwork, and inclusiveness. Sports, fitness, and health options are one of the four service areas; we also include BGCA activities as part of the sports & fitness curriculum. Children participate in recreation activities that will enrich their lives, and teach them important life skills through sports & fitness activities. Sports offer a great opportunity to teach values and foster self-esteem. Designed for ages 6 to 15, the program aims to incorporate healthy living and active learning in every part of the club experience, Healthy Habits, which is also the “Mind” component of Triple Play: A Game for the Mind, Body and Soul, emphasizes good nutrition, regular physical activity, and improving overall well-being. 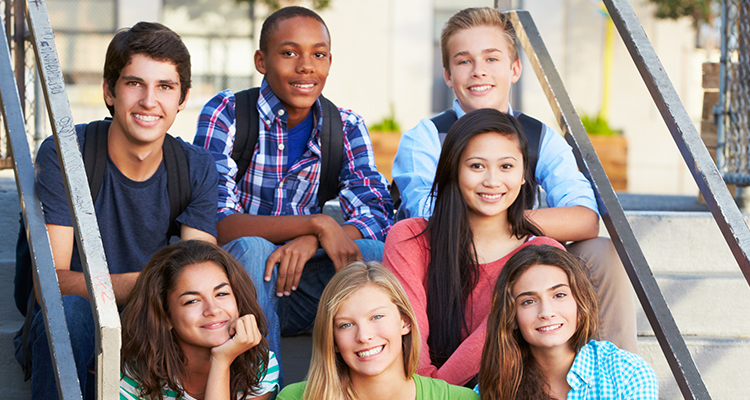 On school out or early dismissal days, the Youth Center opens at 1:00pm. Gym — Full size gym with a basketball court, rock climbing wall, and various sports equipment available for daily use. Teen Lounge — Wide screen TVs, comfy furniture, a wide range of movies and video games that can be checked out, and a movie projector. Technology Center — 15 computers and free Wi-fi. Digital cameras and other technology that youth can sign out. Tech Club is offered weekly which gives youth the opportunity to learn new skills in robotics, Claymation, coding, typing, creating apps, and more! Art Center — Pastels, potter wheel, colored pencils, watercolors, acrylics, and more are available for use regularly in our Art Center. Save your artwork and enter it into our yearly Fine Arts show in January for a chance to compete nationally! Music Room — Full sized piano, keyboard, guitars, ukulele, electric drums, hand drums, microphones, karaoke and more available. Attend MusicMakers club weekly to learn different skills! Game Room — Pool table, video game systems, classic arcade machine, air hockey table, bubble hockey, foosball, board games and more in our game room! Keep your eye out for our regularly scheduled games tournaments! Snack Area — USDA approved snacks are offered free of charge twice daily. Menu offerings are based on input from youth and signed off by a registered dietician. Trips, parties, tournaments, movie nights, dances, and barbeques are some of the exciting special events offered. All off-post trips require pre-registration and a permission slip signed by a parent or guardian. Fees may be charged on some trips. Program details are available at the Youth Center. Torch Club members learn to work together to implement activities in four areas: service to Club and community; education; health and fitness; and social recreation. Torch Club members are a voice for the 6th-8th graders in the Youth Center and meet weekly to help us make the center better for everyone. Keystone Club is a teen-led club which provides teens in grades 9-12 with the opportunity to have a voice in the Youth Center and Community. Keystone Club works with teens to help promote academic success, service to club and community, and career and college readiness. Keystone Members volunteer at special events in the community, make a difference by mentoring younger youth, participate in forums and discussions about changes teens would like in the Youth Center and in the community, and have a say in events and activities we plan and implement. Monthly career, college and financial readiness meetings in partnership with ACS are available. We offer programs in Lego Mindstorm Robotics, Claymation, Digital Skills, Hour of Code, as well as a variety of STEM related projects. Youth gain the hands on experience they need to explore careers in Science, Technology, Engineering or Math. Through our partnerships with the Boys and Girls Club of America and their My.Future initiative, we also provide youth with the ability to develop strong, grounded digital literacy competency through project-based learning experiences. Members can produce portfolios of completed projects and present their projects to earn digital badges. Triple Play focuses on teaching kids about exercise and teamwork. 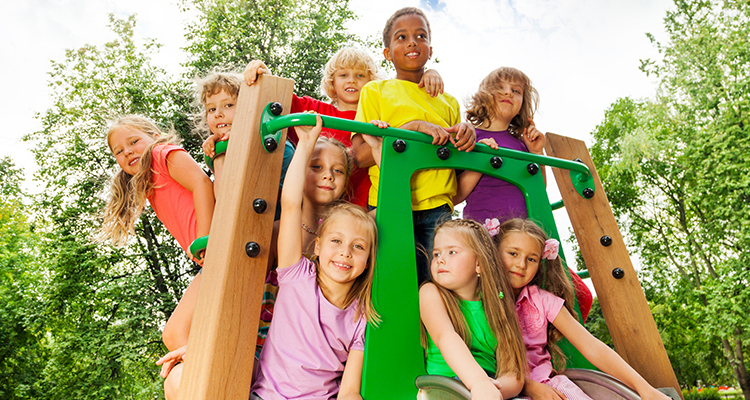 Youth enjoy sustained physical activity, and develop a sense of self-reliance. Staff create activities that promote youth to stay active, and form positive relationships that add up to a healthy lifestyle. Some of the sports and activities played are kickball, four square, capture the flag, freedom ball, basketball, volleyball and more. The club also hosts a Fitness Challenge twice a year in which youth can participate in healthy competition with their peers. No matter a youth’s level of athleticism, all are encouraged and welcome to participate. Contact any of our faclities via their information above with general questions. Any CYS Program registration will begin and end with Parent and Outreach Services. If you are not registered with West Point CYS Services - please request an appointment online via the form with Parent and Outreach Services. Part Day Preschool Space Available!